On the occasion of the Day of Machine Builder, the Ukrainian Parliament awarded two employees of PJSC “EMSS” with Honorary Diplomas and memorable signs. The ceremony of presenting state awards was held at the solemn celebration of the best employees of PJSC “Energomashspetsstal” on the eve of the professional holiday. For a significant personal contribution to the development of domestic engineering, the introduction of modern production technologies, conscientious work and high professionalism, the Honorary Diplomas of the Ukrainian Parliament with the awarding of memorable signs were awarded to the Marketing and Sales Director of PJSC “EMSS” Alexander Goncharenko and the Deputy Chief of Production of the Metallurgical Equipment Nikolay Mihailuk. 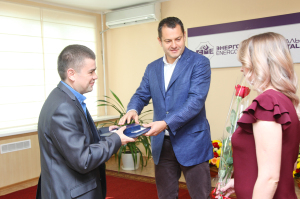 The People’s Deputy of Ukraine, the president of PJSC “Energomashspetsstal” Maxim Efimov solemnly handed over high awards to factory workers. Alexander Vasilievich Goncharenko has been working for EMSS since 2000, he has a rich experience as a manager, a real professional. Thanks to the personal contribution of Alexander Goncharenko, the geography of deliveries of Energomashspetsstal products has recently expanded significantly. Today it is supplied to various cities of Ukraine and foreign countries, (Turkey, China, Japan, France, India). Consumers of the products are many enterprises of the Donetsk region: Azovstal, NKMZ, JSC KZTS, among foreign countries such as: General Electric, USA; Duferco S. A., Switzerland; Repower Systems AG, Germany; »ABB AB» Sweden; MAAG Gear Zamech Sp. z oo, Poland and many others. Nikolay Valentinovich Mihailuk works in the shop of metallurgical rigging of PJSC “EMSS” for more than 17 years. A demanding mentor for young people, under his leadership, has grown more than one generation of machine operators. In the team is the leader. His goal in the work is not only the fulfillment of planned tasks and schedules, but also technical requirements for the quality of products. Under his leadership, a unique lathe of the DVT800x60 model was successfully commissioned with carrying capacity of 250 tons, which produces large-size billets for NPP equipment. Today, the metallurgical tool shop produces products for General Electric, ThyssenKrupp AG, ABB, REpower Systems AG, etc.